The door slam at the end of Henrik Ibsen’s A Doll House is one of the great exclamation points in the western dramatic canon. In his 2017 quasi-sequel, A Doll’s House, Part 2, Lucas Hnath slaps an ellipsis on it. 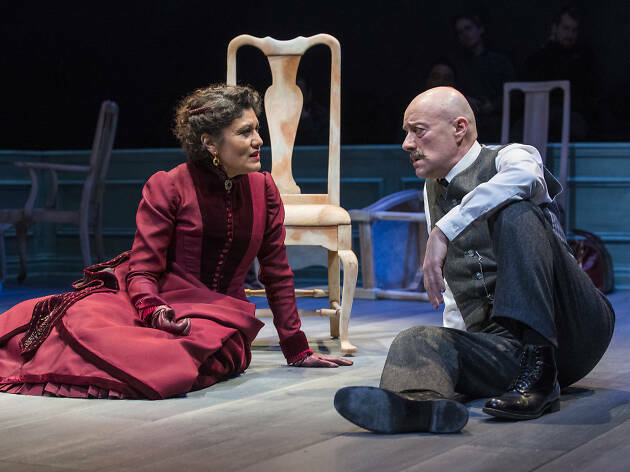 Set 15 years after Nora walked out on Torvald, Hnath’s play smartly picks at the many loose threads of Ibsen’s ending, turning a tidy knot into a messy, unresolvable snarl. A Doll’s House, Part 2 begins not with a slam but with a knock. Nora (Sandra Marquez) has returned to her old home in search of a divorce. She’s a successful writer now, with several feminist novels under her belt, one of which has gotten her in trouble with a conservative judge—trouble that an official divorce from her estranged husband, Torvald (Yasen Peyankov), would fix. As one might expect, he isn’t happy to see her; neither is her former maid, Anna Marie (Barbara Robertson), or her daughter, Emmy (Celeste M. Cooper). Nora may have blazed a trail, but she left burning wreckage in her wake. In contrast with the period costumes by Izumi Inaba, Hnath’s dialogue is unmistakably modern: Robertson lobs a couple exquisite f-bombs. Since the play unfolds much like a series of cross-examinations, Robin Witt stages it like a trial, complete with jury-style audience seating on the stage (designed by Courtney O’Neill) and a Law & Order–esque pounding-gavel sound between scenes. Hnath seems far more interested in argument than drama. At its best, this means characters trying to reconcile the irreconcilable. Instead of a tidy door slam, we get a scene—hilariously played by Marquez and Peyankov—of Nora and Torvald wrecking the stage in a mutual tantrum: a thesis swapped out for a howl. 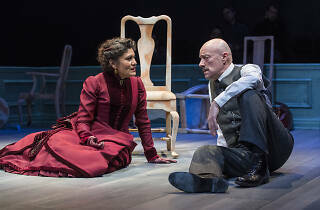 Elsewhere, however, the play’s witty, intelligent dialogue is left to float weightlessly into the rafters, without enough plot to move the story forward. Maybe that’s why, for all of the play’s insights into marriage, commitment, aging and double standards, it never quite rises beyond the realm of a writerly exercise. In writing a play on top of a play, Hnath has sealed himself in. The result, while pleasurable, doesn’t seem to breathe real air. Steppenwolf Theatre. By Lucas Hnath. Directed by Robin Witt. With Sandra Marquez, Yasen Peyankov, Barbara Robertson, Celeste M. Cooper. Running time: 1hr 30mins. No intermission.